Clearwater Marine Aquarium (CMA), home to Winter the rescued dolphin from the movies "Dolphin Tale" and "Dolphin Tale 2," welcomed a new rescued animal as a permanent resident. 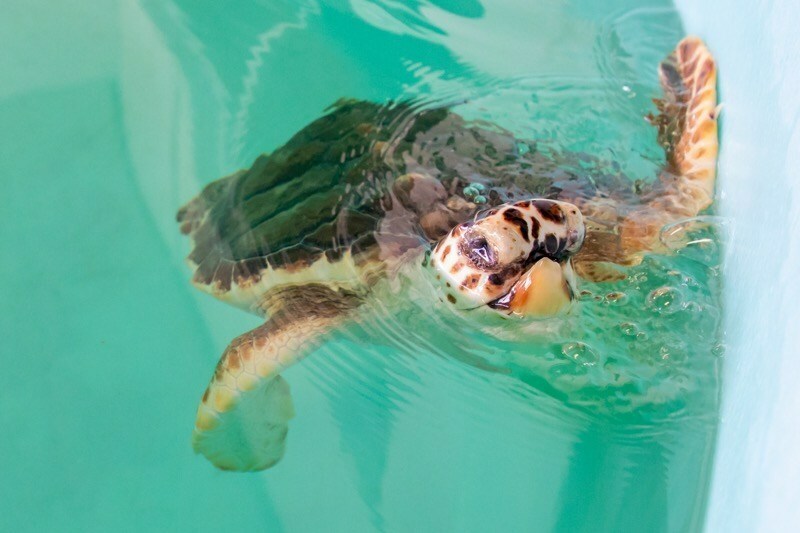 Snorkel, a blind loggerhead sea turtle, is home for the holidays. The small rescued sea turtle is blind and missing parts of her nose and jaw; therefore she is unable to be released back into the wild. CMA rescues, rehabilitates and releases marine life, and permanently cares for those that lack the survival skills to return to the wild. The young sea turtle was found as a "washback," a term used to describe a baby sea turtle that washed ashore due to heavy winds and surf. Snorkel was found with damage to her upper beak and both eyes due to unknown trauma. She was given the name "Snorkel" because of the various tubes used to allow her to breathe and heal during the rehabilitation process. She has recovered from the injuries, but developed some significant physical abnormalities as healing occurred. Snorkel is missing both nasal openings, the upper jaw, and is blind. "Just like Winter the dolphin, Snorkel has inspired our team and guests tremendously through her survival and recovery," David Yates, CEO of CMA, said. "Our goal is for the animals we rescue to return to the wild, but that's not always possible. We are thrilled to offer Snorkel a forever home where she will be well cared for and loved." Snorkel has been deemed non-releasable by the Florida Fish and Wildlife Commission and has become a permanent resident of the CMA family. Guests can come welcome Snorkel home for the holidays at Clearwater Marine Aquarium. Ticket proceeds directly fund the care of our resident animals, like Snorkel. Clearwater Marine Aquarium (CMA) is a 501(c)(3) nonprofit working marine rescue center dedicated to inspiring the human spirit through leadership in education, research, rescue, rehabilitation and release. CMA is home to rescued dolphins, sea turtles, river otters, stingrays, nurse sharks and more. Winter the dolphin's story of survival, after an injury that caused her to lose her tail, has impacted millions of people around the world. A major motion picture, Dolphin Tale, highlighted her life story in 2011. The sequel, Dolphin Tale 2, was released in September 2014 and features the incredible story of Hope, a young resident dolphin of CMA. The mission and potential to change people's lives differentiates Clearwater Marine Aquarium from any other aquarium in the world. WE BELIEVE in preserving our environment while inspiring the human spirit through leadership in the rescue, rehabilitation, and release of marine life, environmental education, research and conservation.